Title: AMERICAN TROOPS ACTING AS POLICE IN SERBIA, EXACTLY AS THE 1952 ILLUMINATI PLAN CALLED FOR! Subtitle: American troops are now on the ground in Kosovo and surrounding areas of Serbia, and are acting as a police force. This is precisely the role envisioned in the 1952 Illuminati Plan to police all areas of the world after the New World Order was established.View map. Clinton is following the plans of the Conspiracy exactly! NEWS BRIEF: "U.S. Troops acting as cops on the beat: U.S. soldiers have become the de facto police in the lawless towns between the Macedonian border post and Pristina", Los Angeles Times, reprinted in The Providence Journal, Friday, June 18, 1999, p. A19. "UROSEVAC, Yugoslavia -- The cavalry is taking charge in the 'wild, wild west' of southern Kosovo, with the U.S. Army and Marines securing the area and keeping the peace as devastated villages slowly come back to life ... Army Sgt. Alonzo Smith of Fayetteville, N.C., started his day dodging a hail of bullets 5 to 10 yards overhead. His unit got eight requests to check out suspected booby traps and mines. They disarmed a departing convoy of Serbian villagers ... They were taunted by a Serbian woman who said they had no business in the area ... They also encountered three members of the Kosovo Liberation Army who were guarding 50 wounded men they'd brought to a local hospital for treatment. The KLA rebels didn't surrender their arms until the following morning." "The U.S. soldiers have become the defacto police in these lawless towns between the Macedonian border post and Pristina, capital of the Serbian province of Kosovo ... Much of the operation is seat-of-the-pants, as the guidelines for the troop's mission don't get into gritty details ... The 2,000 U.S. troops now on the ground in Kosovo have set up camp on a huge open field a few miles from Urosevac. They have been steadily securing surrounding towns and villages, where most buildings have been looted or destroyed." "The U.S. forces search vehicles at several checkpoints along the main two-lane thoroughfare, confiscating any weapons they find. The other day, the troops took at least 116 guns from members of the KLA alone, according to Lt. Col. Robin Clifford, spokesman for KFOR, as the peacekeeping mission is known. 'We own the region from here to Pristina', said a soldier at the border post, where a U.S. flag flies, replacing the Serbian flag that refugees burned soon after NATO's multinational peacekeeping force rolled in last weekend." The most shocking development in this entire "war" in Serbia is the precise way in which the 1952 Plan of the Illuminati to station American troops in the Balkans, Yugoslavia [of which Serbia was a part], Bulgaria, and Romania, has been fulfilled. We detail this 1952 Plan in detail in NEWS1270; if you have not read this article, please do so now, as it will give you a greater understanding of the news of this day and of this article. 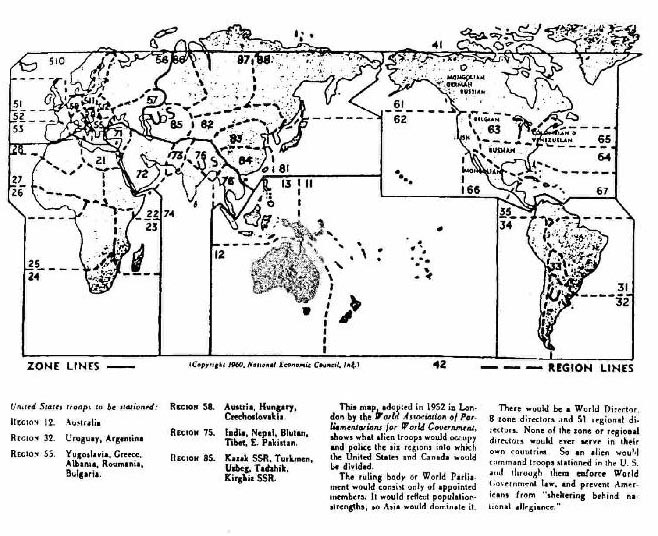 This 1952 Plan foresaw that the world would be patrolled, in paramilitary, and police functions, by different troops drawn from different areas of the world. These troops would set up permanent checkpoints, and would stop anyone for any reason that passed through those checkpoints. American troops were given six areas of the world to patrol, of which the area here, as outlined in the above paragraph, was one. Read and re-read the account given about our activity in this News Brief, because this is exactly the way in which the American people will be treated by the foreign troops responsible for patrolling the United States after the New World Order has been established, and its Global Superman, Antichrist, has arisen and taken control. After the planned simultaneous crises have occurred [Read following articles for more information -- NEWS1056, NEWS1057, and NEWS1074 for full details], the people will be so scared out of their wits they will enthusiastically accept the sudden and dramatic appearance of a spiritual superman, whom New Agers call Maitreya the Christ. He will be the Antichrist. In accordance with Scripture, this man will completely impress the peoples of the world with his supernatural abilities, especially his ability to produce "miracles". All the leaders of the world will pledge their total support of him and his global "peace plan". When The Christ explains his "Peace Plan", his plan will include the 1952 plan to divide the world into the various regions set out in that plan [Read NEWS1270]. At that point, only American troops will be stationed in the Balkans, Yugoslavia [which includes Bosnia and Serbia], Greece, Romania, and Bulgaria. It will be highly interesting to see the scenario play out which will remove all NATO troops from this region and replace them totally with Americans. Obviously, the number of American troops will have to increase dramatically in this region, a situation which will be politically untenable with American voters, at least right now. Therefore, I really expect more severe trouble brewing that might yet cause American ground forces to be beefed up dramatically. Perhaps we might see the situation where the call for a greatly beefed up force will be rejected by all members of NATO, except the United States. Perhaps President Clinton will have to pour in tens of thousands more troops into this region to quell the warfare from the Serbian Army, which is still unbloodied in battle. If the planned scenario calls for NATO countries to refuse to send troops, Clinton will have no "choice" but to order Americans into the battle. At this point, we might even see the majority of American troops to be sent out of this country, including reservists and many National Guard units. Thus, when the planned simultaneous crises erupt, America might not have the military forces needed to restore, and keep, order. Thus, Clinton might be "forced" to call for foreign troops to enter our country to help restore order, fulfilling the words of Former National Security Advisor, Henry Kissinger, that the time would come when Americans would welcome foreign troops into cities like Los Angeles. Old Henry almost let the cat out of the bag with that statement, as this is the ultimate plan. When you see the planned simultaneous crises breaking all over the world, you know the next step is for Clinton to announce that we must dissolve our Constitutional form of government in order to effectively battle against all these forces arrayed against us, you can bet your bottom dollar that his promises of a speedy return of liberties once the crises are over is an empty sham. Yet, a vast majority of the American people will not believe this scenario possible, but will fall into endless debates about other meaningless aspects of the crisis. The time of the End will be very near. It is time to really get serious about spiritual preparations for the End of the Age. Events are picking up speed and will soon culminate in the appearance of Antichrist.